May 4-7 – Paul and Corie Bratter are newlyweds in every sense of the word. He’s a straight-as-an-arrow lawyer and she’s a free spirit always looking for the latest kick. Their new apartment is her most recent find – too expensive with bad plumbing and in need of a paint job. After a six-day honeymoon, they get a surprise visit from Corie’s loopy mother and decide to play matchmaker during a dinner with their neighbor-in-the-attic, Velasco, where everything that can go wrong, does. Paul just doesn’t understand Corie, as she sees it. He’s too staid, too boring, and she just wants him to be a little more spontaneous. 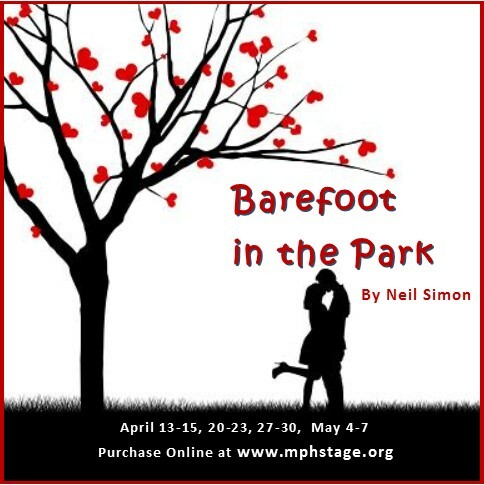 Running “Barefoot in the Park” would be a start. Historical Note: Opened on Broadway in 1963 (Robert Redford + Elizabeth Ashley) and in movie theaters in 1967 (Robert Redford + Jane Fonda).